Tiger Woods playing his first ever Tour Championship since 2013 shot a splendid 65 to join Rickie Fowler at the top of the board with an interesting eagle on the 18th. After hitting a 320-yard tee shot on the downhill par-5, Woods hit a high, fading 5-wood that landed softly on the green. He holed the 28-foot putt for eagle. A victory is the obvious next step in his comeback. He’s given himself another opportunity for win No. 80 win after shooting 65 on Thursday at East Lake Golf Club. He shares the first-round lead with Rickie Fowler. the good man of golf had just a win on the tour in this season, coming all the way back in December 2017 at the Hero World Challenge, an event hosted by Tiger Woods. Rickie too shot a 65 to join Tiger at the top. This is the second consecutive tournament in 2018 where Woods has shared the opening round lead, previously he held the co-leaders position with Rory McIlroy at the BMW Championship at the Aronimink Golf Club. The current leader on the FedEx Cup standings with back to back wins at The Northern Trust and Dell Technologies Championship, Bryson Dechambeau currently stands T-21 at 1-over 71 with Billy Horschel, Patton Kizzire, and Patrick Cantlay out of the top-30 men in the field. 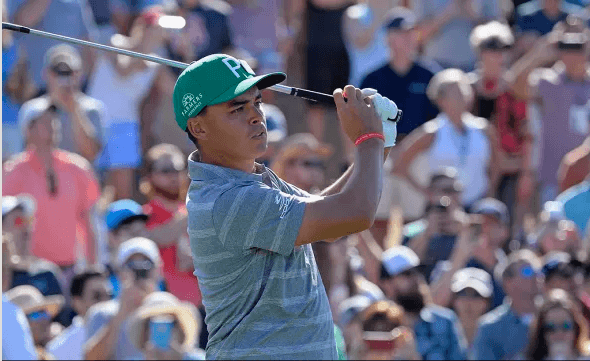 Filed Under: News Tagged With: Aronimink Golf Club, Billy Horschel, BMW Championship, Bryson DeChambeau, Dell Technologies Championship, Dustin Johnson, FedEx Cup standings, Hero World Challenge, Justin Rose, Justin Thomas. Keegan Bradley, Patrick Cantlay, Patton Kizzire, PGA Tour, Rickie Fowler, Rory McIlroy, The Northern Trust, Tiger Woods, Tony Finau.